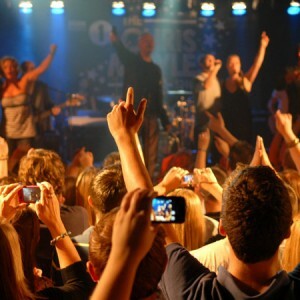 Rockaoke Brand Experience - promote your brand with a live band! 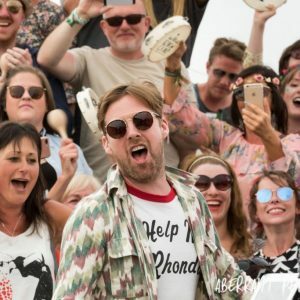 It is no surprise that ROCKAOKE have become a hit for experiential marketers wanting to exploit the bands natural synergy with festivals, harnessing the groups dynamism and mastery of fun to enthral the highly valuable youth music demographic. 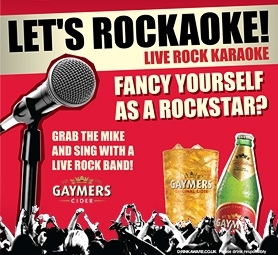 Between 2008-2010, ROCKAOKE were the focal point of Gaymers Cider’s brand activation across major music festivals included Rockness, Wireless, Hard Rock Calling, Leeds, Latitude, The Big Chill and Bestival. Three daily sets would draw crowds of hundreds who would sing, drink and dance away the day within the brand experience. 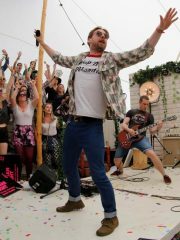 For some, ROCKAOKE in the Gaymers Cider Garden would become the highlight of the festival! Nestle had a similar idea in 2010 and placed the band in the middle of the “Kit Kat Chunky Music Break” tent at V Festival. 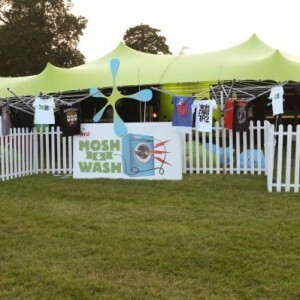 In 2012, ROCKAOKE featured in the Persil “Mosh & Wash” campaign with live performances at Camp Bestival and Disley School, Manchester. 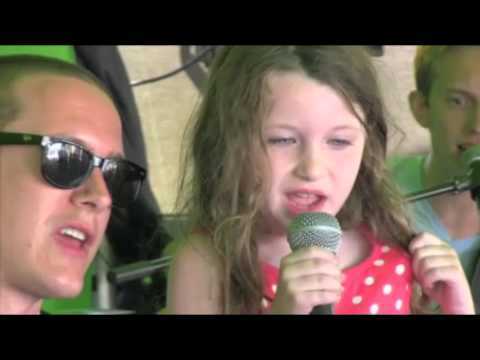 In 2014, ROCKAOKE North & South starred in the Carlsberg tent on both days at V North and South. And most recently, the band put their ACOUSTAOKE hats on to promote Old Mout Cider at Standon Calling 2015. 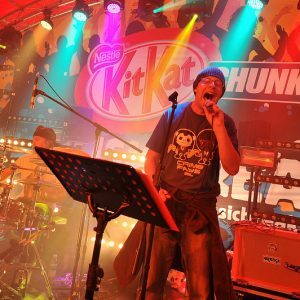 Following their success with the concept at major UK festivals, Gaymers also took “Let’s Rockaoke” on the road with a 22-date UK tour of O’Neill’s high street venues and a tour of UK universities and student unions. 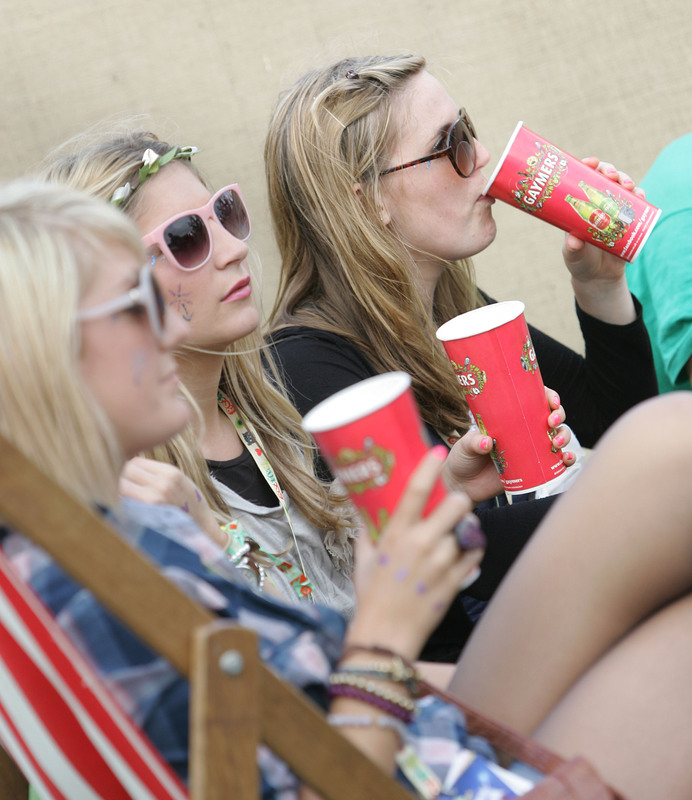 Gaymers Cider brought ROCKAOKE to major festivals in the summers of 2008 and 2010. All part of their brand activation campaign to align their product with the thing they identified their target audience liked most -having fun and enjoying music! This campaign took in festivals like Glastonbury, Leeds, Latitude and Lovebox. In 2009 alone, Gaymers grew their brand by 200% – twice as much as any other cider brand. 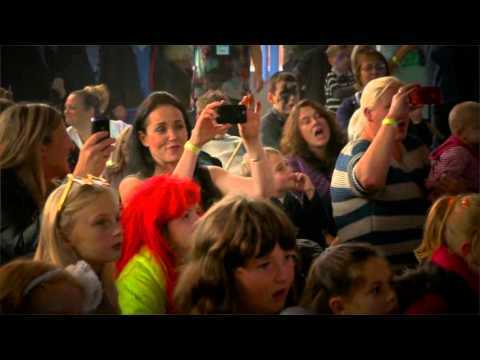 The summer of 2012 saw the band develop a stripped down, kid-friendly ACOUSTAOKE offering for Persil’s Mosh and Wash activity at Camp Bestival and follow-up event at Disley Primary School, Cheshire. ROCKAOKE first worked with THE CHRIS MOYLES SHOW on 7th april 2009 at Milton Keynes and went on to do 11 shows with Chris and the team between then and the time Chris left Radio 1 in 2012. These included a four date UK tour to celebrate Chris becoming Radio 1’s longest serving breakfast show host! 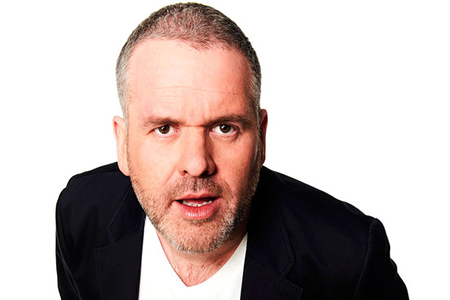 Nights with the Chris Moyles Show were in fact a brand awareness exercise for Radio 1. 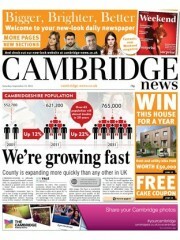 Areas where the Chris Moyles Show needed a ratings boost were carefully targeted. 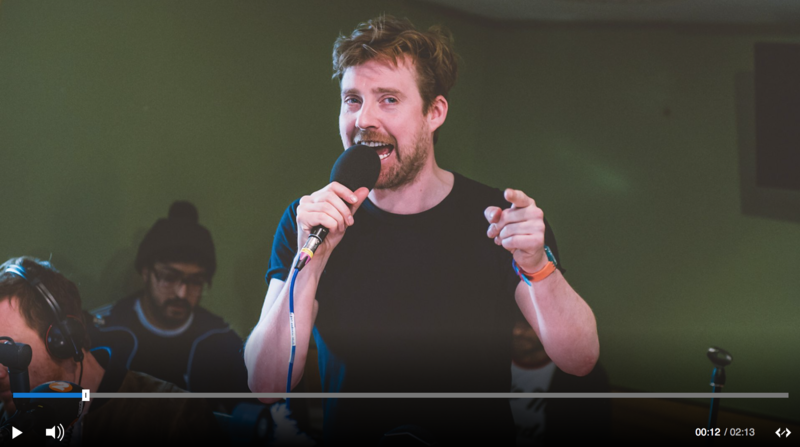 These included Hull, where Chris made a big point of reminding the audience that his was the 5th most popular breakfast radio show in North Humberside…! They are also a go to for the music industry heavyweights. 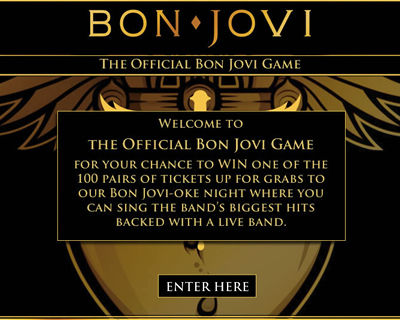 For example, to celebrate and promote a new BON JOVI GREATEST HITS album, MERCURY RECORDS invited ROCKAOKE to put on a bespoke and unique BON JOVIOKE. The band integrated 20 BON JOVI classics into a set list already bursting with ROCK anthems and gave superfans of the band a night to remember – including the opportunity to belt out their favourite songs in front of an adoring crowd. Some of our favourite photos from ROCKAOKE brand experiences. Acoustaoke makes its debut at Camp Bestival Mosh and Wash.
Rockaoke continued their relationship with Gaymers cider last summer as an integral part of the summer brand experience activity at Latitude, Big Chill and Leeds festivals. 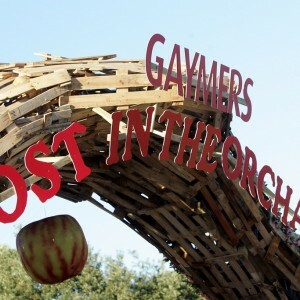 The theme for the Gaymers’ Lost Orchard brand experience in was “unexpected musical moments” and Rockaoke definitely delivered on this brief. What better way for a festival goer to interact and connect with a brand than to front their own rock and roll band on a big stage in front of their friends, family and 300 people. The boys played around 30 sets at the festivals, getting nearly 500 people up onto stage with them in various sized groups with different abilities and ever surprising levels of exhibitionism. Aside from the stars they created on stage they entertained around 5,000 people across the summer. They were always pro-active and professional, bringing energy, passion and enthusiasm to each and every set no matter what time of day and whatever the weather. They were excellent at working with the different agencies we employed to ensure they were always delivering an “on brand” experience for Gaymers and they always embodied the friendly, quirky and welcoming experience we were looking to create. It is these aspects as well as their rock prowess that ensured all sets that they performed drew large, happy and engaged crowds and they always represented excellent value for money with regards to the return the brand gained from a Rockaoke gig. 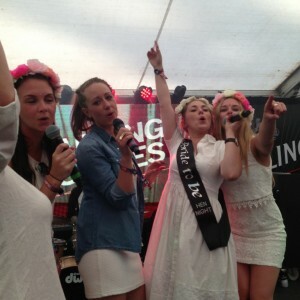 In short Rockaoke are fantastic to work with and we could always guarantee a Rockaoke event would be a roaring success. Just had to drop you a line to say Thank you once again for helping our guests to “Party like Rock stars”! 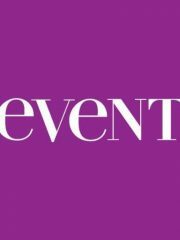 The Hard Rock London hosts numerous events during the year including many events booked by private corporate clients, and time and time again, the feedback that I receive from these guys is how fantastic you all were! From the willingness you show to accommodate the clients requests for music genres, to encouraging the more shy amongst them to discover their ”inner rock god”, you always know how to ensure that everyone has a fantastic and memorable night – and more importantly, want to come back to us – with you guys providing the Rockin entertainment! Above all else , I know that you are a group of highly professional individuals with whom Hard Rock is proud to be associated. Thank you guys, for keeping the rock n roll alive! I have had the pleasure of working with Rockaoke for nearly 10 years in a variety of scenarios on Sponsor Brand Experiences. I have nothing but praise for their amazing musical expertise and professional attitude towards any project. They have an unrivalled ability to adapt to any given situation or audience. As front wo/men of the band, Kirsty and Mat also act as highly accomplished MC’s, able to effectively deliver any sponsor messages and keep the crowd entertained. Dan and Jon (on lead and bass guitar respectively) have incredible musical abilities and are extremely skilled in making any participant feel like a true Rock Star. On drums, Basil is second to none. An unsung hero and creative genius, he recently custom-made a fully-functioning drum kit using only old Washing Machine parts for a Washing Powder brand. Needless to say our Client was incredibly happy. I cannot recommend this wonderful group of musicians and truly lovely people enough and would encourage anyone to work with them. I have been meaning to contact you to say thanks to you and the Rockaoke team for putting on such a great show (and playing over the 2 hours!) at the Heineken Product Launch. We had great feedback from the delegates and you really helped to make the night memorable as well as enjoyable. I really appreciated that you got in the spirit of the event and even wore the customised T-Shirts! I know the client loved you guys so much she wanted you at her wedding so if she can help I’m sure she will! It was great working with you, I hope we get to work together soon. A little excerpt from the Daily Star playlist page featuring ROCKAOKE in the Gaymers Cider Garden at Leeds Festival 2009.